Interior doors are a major feature in all of our homes, whether there is a row of them lining either side of a hallway, or it is a set of double doors to a formal dining room which takes center stage on a wall. Because these doors are prominent and tend to pull the eye, it is important that interior doors be painted well. 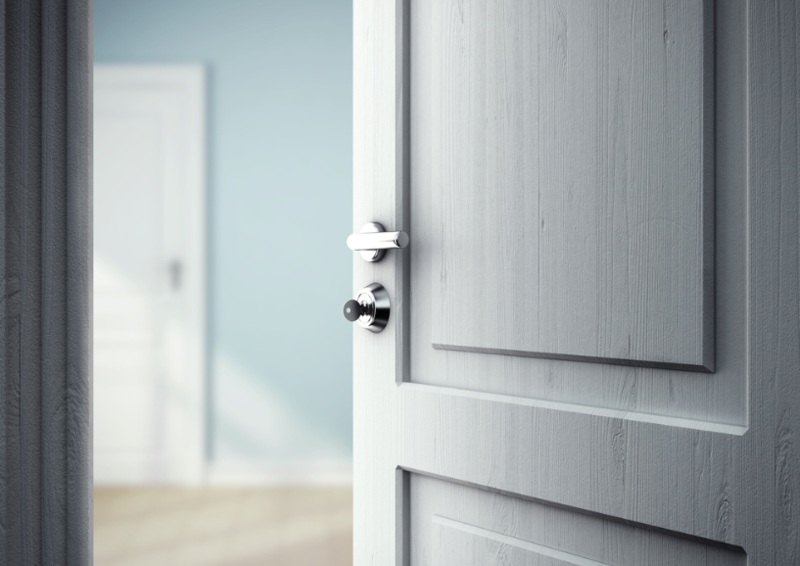 That’s why we’re offering this guide to help you make sure your doors look fantastic! Let’s take some time to explore the process of painting interior doors, including the paint choice, the project preparation, the actual painting, and then the final cleanup. For most doors, the best interior paint is a high-quality latex/acrylic semi-gloss. The quality will help you get longer-lasting color and more resistance to wear. Since you only need a little bit of paint for an interior door, it is worth it to buy a premium paint brand. Using semi-gloss paints will provide you with two benefits. First, it is highly resilient to bumps, scuffs, stains, and scrubbing, which is exactly what you need for a door. Second, semi-gloss paint has a nice, eye-catching shine to it, drawing the eye to the grooves and patterns on the door. Choosing the paint color for your interior door can be a little more confusing. Most people go with the classic white, which is a fantastic choice. It matches everything, it looks clean, fresh, and sharp, and it never goes out of style. However, other options are becoming popular these days. For example, black and dark gray are making their mark in stylish homes these days, giving an unexpected, bold appearance. Other color choices would depend on the rest of the colors in your room. For example, if you have a multi-colored rug with a little bits of red, a red door could compliment it well. Alternatively, if your walls are beige or tan, a sage green or earthy brown door could look amazing. Whatever color you choose, make sure it stands out from the surrounding walls, so you make the most of your interior door painting. If you are painting one or two interior doors, a quart of paint should be sufficient for your project. As with any interior painting project, the surfaces should be clean before the paint can be applied. This means that fingerprints, dust, cobwebs, and other such contaminants should be washed off with a damp sponge. Use a bit of soap if necessary. Be careful to clean in the cracks and grooves, in the corners of the doorframe, and the floor on the surrounding area… anywhere grime or dust bunnies could accidentally get into the paint. Next, you need to isolate the surfaces you will be painting. If you are painting the door but not the trim, then you may do best to remove the door from the wall. Usually, this just means removing nine screws. You can then lay the door flat on blocks over a tarp or sheet for painting. If you decide to leave the door in place, you will need to use painter’s tape and plastic to protect the floor and the adjacent surfaces. Removing the door handle is also a handy step. Usually it just involves removing two screws. That way, the door is very easy to paint. Also, you will not get awkward brush-stroke patterns around the handle, since you can paint in a straight line right over the doorknob location. Alternatively, you can use painter’s tape to carefully cover all visible surfaces of the doorknob. If the door has any gouges or holes in it, they should be patched before you begin painting. Wood filler or spackle can fill most of these types of flaws. Apply it with a putty knife, and then let it dry. When it has hardened, use light sandpaper to smooth out the spot and blend it as much as you can. Do I Need to Prime the Door? Primer is very useful for covering difficult stains, making the transition from a dark color to a light one, or to prepare any spots that have been repaired (like in the previous step). If you are simply putting a new coat of paint over an old one, and the old coat of paint is in decent shape, then priming should not be necessary. Can I Paint It Now? Brush it on thickly, but not so that it drips and runs in globs. Start at one end and work towards the other. If the door is upright, start at the top and work your way down. Keep checking back over what you have already painted, to see if drips or pools have formed. If they have, quickly brush them smooth again. As you apply paint into grooves and corners, it is fine to use the brush from a variety of angles to make sure the paint gets into each spot. Make sure that your final brush strokes in each area are in the same direction of the wood grain. Smooth the paint in this direction before it has begun to dry. Once the paint is applied, take precautions to make sure no one touches or bumps the door until the paint is dried. You will likely want to apply a second coat, so just repeat the steps above. You want to wait until the paint is thoroughly cured before peeling off painter’s tape, if some of the new paint is overlapping the edge of the tape. It may help to use a razor blade to make a very gentle cut at the edge of the tape, so that the paint film is not pulled off with the tape. Make sure the lid is securely on the paint can if you have any leftover paint. Wash out your paint brush with water, gently massaging the bristles to get all the paint out. Then, hang the brush to dry. Now, you are ready to enjoy your beautifully-painted interior doors for many years to come! Are you thinking you’d like some painting done in your home, but you’re not sure you’re up for this much of a process? We encourage you to consider hiring a professional. If you just want to have a couple doors painted, A.G. Williams’ Painter 4a Day program could be the ideal solution. With perfect convenience and fabulous results, you could have the transformation you are looking for in just one day! A.G. Williams is a local house painter serving New York and Connecticut. We have been providing interior painting services in this region for well over 100 years, earning an unsurpassed reputation for excellence. Please contact us if you have any questions, or if you would like a free house painting estimate. Does Your Drywall Need Repair? And What Can a House Painter Do About It?